Digs fields, on a cold Monday evening: men’s teams swarm the grounds, preparing for the Wits internal football league matches. But in a small corner of one of the two sprawling fields, the Wits ladies football team plays a 4-a-side game. Running laps around the field, male players pass derisory remarks. “Hayi ngamantombazana k’phela lawo” (Forget it they’re just girls). Coach Jabulile Baloyi, a former Banyana Banyana midfielder, responds by demanding her players focus on the game. “Enjoy the last five minutes of the game, ladies.” She did not need to. Despite having their league game for that evening cancelled, the women got through a two-hour training session with visible delight, cajoling each other through the gruelling fitness drills set by Dlamini. “It’s all about commitment. It’s the same thing with the course. 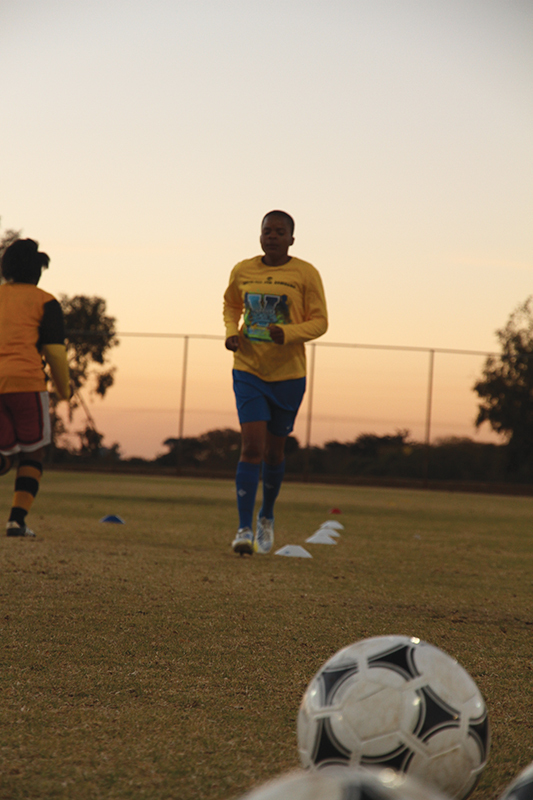 The difference is commitment… putting in those extra hours and it pays off,” said team captain and goalkeeper Kholosa Dzakwa, HDipAcc. Dzakwa, who is in her fifth year playing for the team, said most of the players had developed a real passion for the game. Recruitment, however, was still their biggest problem. “We have about 25 players on the team but about 16 are not registered Wits students…The typical player who maybe comes from Soweto struggles to come to training (in the evenings). But some of us have stayed for the love of the game,” she said. Dlamini said she wished the team could participate in a Varsity Cup type of tournament as it provided a higher level of competitiveness. Currently, the team participates in USSA (University Sports South Africa) league, and lies seventh in the 12-team league after losing only three games, with five more rounds of matches to go.